Reception for participants opens at 2 p.m.
Continue the conversation over a buffet dinner, provided as of 7 p.m. The entrepreneurs attending the conference and the OP3FT team will be happy to answer your questions. Finalists Frogans sites will be presented live. The jury is presided by Sébastien Bachollet, ICANN Board member from 2010 to 2014, Member of Alac - European end-user. End of the conference at 10 p.m.
Frogans Awards 2 is a global contest for the creation of Frogans sites, open to everybody, including developers, freelance designers, and students. Frogans Awards 2 is a great opportunity to demonstrate your creativity, win prizes, and earn global recognition. Two suggested themes are "e-Commerce" and "Surprise me! ", but feel free to follow your heart and create the Frogans site(s) of your dreams. If your Frogans site is selected for the final round, you will win a Frogans address of a public Frogans network free of charge for one year. You can choose your Frogans address (subject to availability) in one of 179 possible languages. Thanks to this Frogans address, everybody will be able to access and browse your Frogans site during the conference (and afterwards, too). This means that your Frogans site will be one of the very first to be published on the Internet. The results will be unveiled live during the conference. The prizewinners will receive other Frogans addresses of public Frogans networks, along with Frogans site hosting for one year. 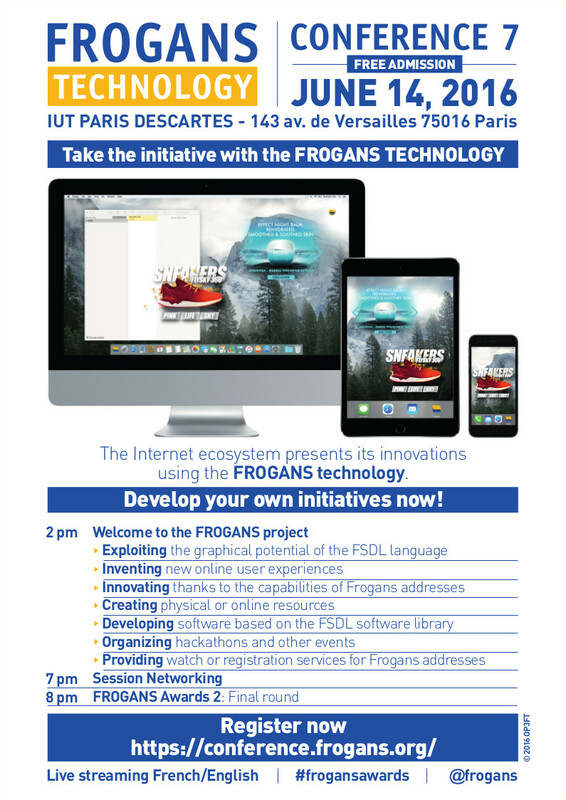 Submit your Frogans site before June 7, 2016 12 p.m. (Paris time) - 10:00 UTC. To submit your Frogans site, send an email to the following address frogans-awards@frogans.org (if you submit several Frogans sites, send one email for each). Tweet your participation in the #FrogansAwards: the more retweets, the better your chances to be selected for the final round! If your Frogans site is selected for the final round, we will contact you so that you can choose your Frogans address of a public Frogans network. All participants selected for the final round will be notified by June 8, 2016, 8 p.m. (Paris time) - 18:00 UTC. Frogans Technology Conferences are public events organized by the OP3FT, the non-profit organization whose purpose is to hold, promote, protect and ensure the progress of the Frogans technology in the form of an open standard for the Internet, available to all, free of charge. Since the Frogans technology allows the introduction of a new type of site on the Internet, anyone who has a role to play in the Internet ecosystem should participate in Frogans Technology Conferences: end users, content publishers, designers, developers, hosting providers, intellectual property counsels, lawyers, trademark holders, entrepreneurs, etc. The aim of Frogans Technology Conferences is to enable everyone to understand the challenges and opportunities provided by the Frogans technology to develop innovative solutions and/or to create new business. Frogans Technology Conferences are also an opportunity for participants to interact, promote their initiatives in relation to the Frogans technology, put questions to the people behind the Frogans project, and share a drink and a bite to eat. The OP3FT recommends that you attend each Frogans Technology Conference even if you have already attended a previous conference since the program is always different. Participation in the Frogans Technology Conference 7 is free, however, registration is required as seating is limited. Can't make it to Paris? No problem. You can view a live transmission or a recording of the conference online.